Lice Fairyz Preventive Mint Spray Naturally and Safely Repels Head Lice with 100% Natural Essential Oil. Effective Against Super Lice. Use Before or After Lice Treatment. Non-Toxic. No Pesticides. View More In Lice Treatments. The Lice Fairyz and our Lil' Lice Helpers will eliminate lice from your life quickly and easily. We know everything there is to know about lice and want to share that knowledge with you! So, we have created the best natural, science-based, non-toxic (pesticide-free) products proven to eliminate lice from your life. 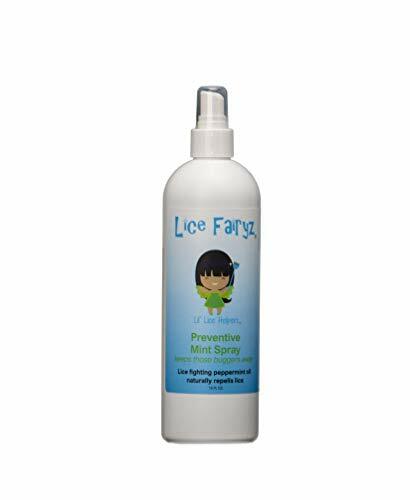 Keep lice away from hair, hats, coats, and more with the Lice Fairyz Head Lice Repellent Spray. Naturally repel lice with this spray, safely and without pesticide poisons. Made with essential oils, this spray effectively covers hair, skin, and clothing with a pleasant scent that is naturally offensive to lice and their friends. Unlike pesticide-based lice-fighting formulas, Lice Fairy Spray is safe to use as often as necessary, without lengthy waiting periods for effectiveness. Use with Lice Fairyz Shampoo, Lice Fairyz Conditioner, and the Lice Fairyz Terminator Lice Comb (all sold separately) for comprehensive, non-toxic lice relief. Each pack contains one 16-ounce bottle of Lice Fairyz Peppermint Spray. Store this product responsibly, out of the reach of children. Lice Fairy is a natural-based formula designed to help remove and repel lice safely and effectively with no harmful chemicals or pesticides. USE DAILY TO KEEP LICE AWAY FROM YOUR HEAD. Scientifically-based natural ingredients (essential oils) will naturally prevent lice and absolutely keep them off your head. SAFE FOR KIDS of all ages. No pesticides. Non-toxic. USE AS OFTEN AS YOU LIKE, any time you are concerned about lice in your immediate surroundings. Safe to use on hats, clothes, helmets, backpacks, ben linens, furniture, etc. If you have any questions about this product by Lice Fairyz, contact us by completing and submitting the form below. If you are looking for a specif part number, please include it with your message.